International Journal of Research in Health Sciences,2017,5,3,54-58. 1Consultant Pulmonary Medicine in Columbia Asia Hospital, Patiala. 2Microbiologist, Pvt Practice Patiala. 3Immunization Officer, Department of Health and Family Welfare, Govt of Punjab, 4MCH Urology in CMC Ludhiana, 5Anesthetist, Pvt practice Bathinda. Background: Various comorbidities are associated with COPD. Aim: To study the pattern of cardiovascular comorbidities in patients of COPD. Material and Methods: The study included 300 patients presented with signs and symptoms suggestive of COPD. The diagnosis of cardiovascular comorbidities was made on the basis of clinical examination of the cardiovascular system, electrocardiographic changes and echocardiography. 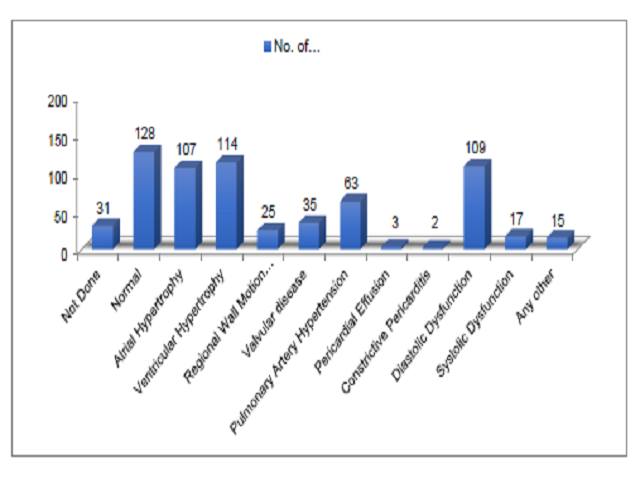 Results and conclusion: On electrocardiography, around 159 (53%) cases showed changes on ECG suggestive of presence of cardiovascular morbidity. ECG showed changes suggestive of atrial hypertrophy in 105 (35%) patients and ventricular hypertrophy in 72 (24%) cases.78 (26%) cases had sinus tachycardia on ECG and 55 (18.3%) had changes of coronary artery disease, 6 (2%) cases had arrhythmia and 3 (1%) had acute myocardial infarction changes on ECG.